LED lighting is a perfect fit for the outdoor conditions around your property. LED stands for light-emitting diode, which is a two-lead semiconductor source of light. It provides a low energy and low heat option that gives off a strong light beam. Enhanced Outdoor Lighting & Design provides experts in LED lighting to help you brighten and enhance your property’s outdoor areas in an affordable, eco-friendly way. We can use this solution to add well-designed outdoor lighting to the exterior of your business property or your home. What’s great about LED for exterior areas? Unlike incandescent lighting that gives off heat, LED lights stay cool to the touch. This is ideal for an outdoor setting where the lighting will be sitting near plants, wood chips, and other natural materials. Lighting the exterior of your home or business doesn’t mean you have to sacrifice your eco-friendly values or spend a lot of money. LED lights can provide the perfect solution. These lights use electricity much more efficiently than incandescent lights. They will reduce the amount of energy your outdoor lighting requires, which provides an excellent environmentally friendly and cost-saving option. This type of lighting is also durable and long-lasting, unlike their more delicate incandescent counterparts. An initial investment in LED could last you a lot longer and provide more durability to keep your property consistently lit on the outside. As if that weren’t enough benefits, these lights are also smaller, which means they will interfere less with your outdoor aesthetics. Plus, they are safe since they don’t give off UV rays and they aren’t made with toxins. When you want low voltage landscape lighting for your home or business, LED lighting provides the answer. The light goes through a process that takes it from 120 volts down to only 12 volts, for a significant reduction in voltage. With low voltage, you can save energy and money by brightening your landscaping. While LED lights provide a low voltage option, you won’t sacrifice anything in the look of your exterior. That’s because these efficient bulbs produce a strong beam of light that will expertly lighten up your outdoor areas. LED lights are simply more efficient, as they just take 15 percent of a halogen light’s energy usage while giving off up to 85 percent extra light output. With these bulbs, you gain some customization over the look of your exterior lighting. By using bulbs with different Kelvin amounts, you can choose from a softer yellow beam, a brighter white beam, or a bright blue tinted beam. You may even decide to customize the color to the area, creating different effects throughout the exterior of your property. When you use LED lights in your outdoors, you can expect strong beams of light to illuminate your property for years to come. You won’t have to worry about wasted energy or money, as these lights provide an affordable, durable, and efficient lighting solution. There are many ways you can use LED exterior lighting. You can shine beams of light on your home or business buildings. Also, this lighting can border walkways and be used to enhance trees, signs, and various features and structures of a property. LED lights point their beams of light in one direction rather than giving off light all around the bulb, which is different than both compact fluorescent and incandescent lights. This feature makes LED lights perfect as outdoor spotlights. 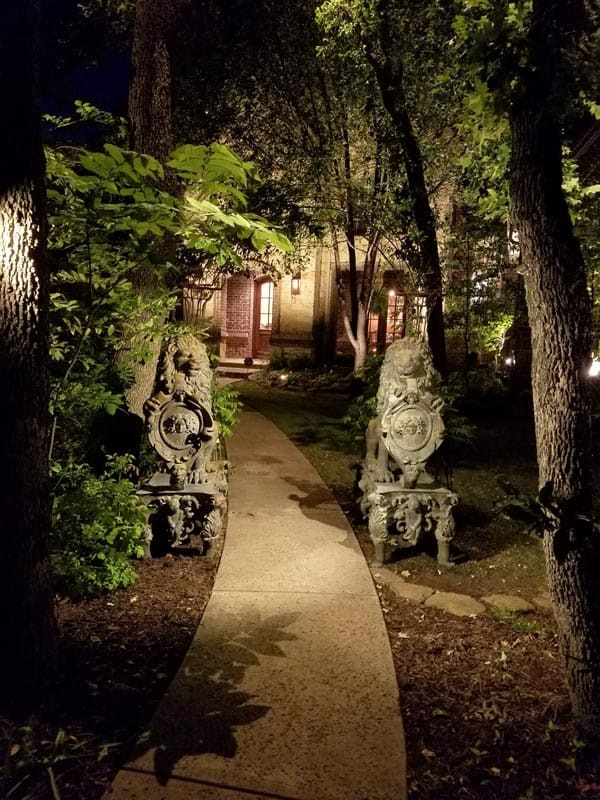 You could use them to direct light to specific areas around the property, allowing you to shine a beam of light on certain trees, a sign, decorative features, your front door, and other areas. Whether your purpose for spotlights is for aesthetic value or improving the safety and security of your property — or both — LED lighting will give you the right features to fit your spotlighting goals. At Enhanced Outdoor Lighting & Design, we provide the San Antonio and Austin areas with LED lights of the best quality available. Our LED light fixtures give long-lasting use, coming with a 15-year warranty or 40,000-hour lamp life. We also have an upgradable option, which comes with a six-year warranty. Ask us about the difference and which type would be better for your needs. Whether you already have some lighting ideas or would like to know how LED lighting could be used within your property, our Enhanced Outdoor Lighting & Design experts can help you create a design that brightens your spaces in the best way possible. We can also answer any questions you may have about this type of low voltage and high-efficiency lighting. 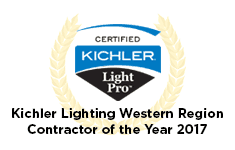 For a free consultation and quote on LED outdoor lighting, contact us today.